There's no way this could compare to Michelangelo's work...but...I tried. Oh my goodness! I got to see this in Rome, and this looks so much like it! Good job! This is so awesome and just gorgeous! I love how the light falls so gently and highlights just perfectly! Incredible! Congratulations! You won 1st place in my "Biblical/ spiritual contest". As I said before this is simply beautiful. A marvelous work of art that conveys the spiritual. 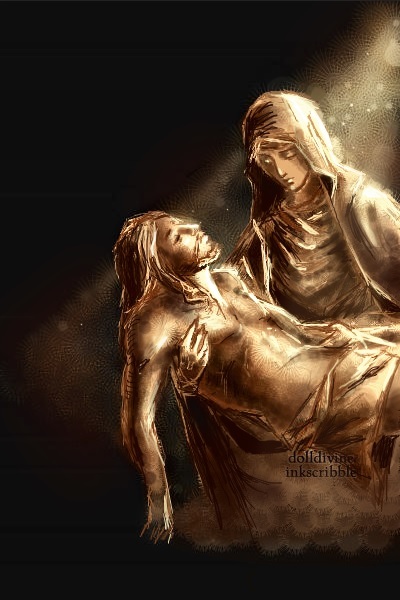 Incredible depiction of the pieta! Accurate and so moving. Wow. Just wow. There are no words to describe the beauty of this. I can't pick my jaw off the floor. Just looking at this makes me emotional. Bravo, SJK. Wha, wha, wha. How? What? Where? When...? Oh never mind. It would take to long to say it. I seriously and truly thought that this was a real picture. HOW DO YOU DO THIS???? The art is beautiful. The touch of an artist is not just the skill used to create but in the depth of the creation.